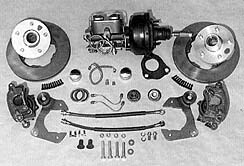 Disc Brakes for 1964-1972 Nova-Chevy II cars. The new disc brake kit from Classic Performance Products, comes with giant 11-inch rotors, lightweight custom aluminum hubs, Timken roller bearings, single-piston calipers, caliper mounting brackets, seven-inch booster master cylinder, proportioning valve/bracket, stainless hard lines, brake hoses, and necessary hardware. Engine compartment cross-over line and rear brake hard line are optional. Also, all parts can be ordered separately. So how's your early to mid '60's Nova stopping these days? Not too bad, you say, but sometimes not too good? Small wonder, since those factory drum brakes are, at best, okay, but time and mileage will definitely reduce the standard shoe and drum's reliability, especially up front. For example, most who've owned a'62-'67 Nova have probably experienced fade as well as a great deal of wandering under panic stop conditions. 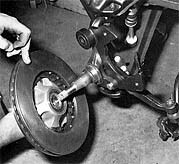 This is where front disc brakes, which were offered as an option on 1967 Novas, can make a tremendous difference in the stopping power of these increasingly popular machines. Power binders definitely help get the car stopped quicker and assuredly straighter. Because of the more efficient stopping power of a front disc brake/rear drum arrangement, a few after market Manufacturers have come up with their own kits to retrofit early Novas that didn't have or come with the option. 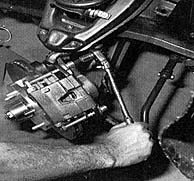 Most kits require removal of the spindles so they can be machined to accommodate the calipers, and most move the wheels outward. But not these from Classic Performance Products. When we heard that Jim Ries (proprietor of the Buena Park, California firm, which manufacturers Chevy and Ford truck disc brake kits) was venturing toward the passenger car line ('55-'57 Chevy, to be exact), we asked him if he would consider a kit for the '62-'67 Novas. Fortunately, we must have been on the same brain waves, because he immediately stated that, "Early Novas are what's happening, and so are disc brakes. "Since the '62 and '63 models have a different size wheel bearing/spindle diameter, and the '64-'67's seem to be gaining in popularity (and their spindles are identical), Jim decided to prototype a kit for the latter and we were there to look in on how it all went together. 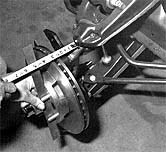 Also, for this application, the donor car's 14 x 6 American Racing Torq-Thrust aluminum mag wheels were a concern for caliper clearance, but Ries assured us that his kit would work just fine. First thing on the agenda was the booster and master cylinder. Jim removed the original master cylinder, and unbolted the steering column/master cylinder brace so as to remove the pair of studs in the heavy-duty bracket. Then the brace for the new power booster was installed under the dash. Jim originally wanted to use a factory power booster, but was having difficulty locating one (not to mention the fact that when a unit finally showed up, the master cylinder he planned on using was too long, causing interference problems with the shock tower and inner fender). Therefore, Jim decided to implement "Plan B," which meant using a new, smaller (7-inch diameter) and narrower booster. It was a tight fit, but this combination cleared. And to make things easier for the do-it-yourselfer, the setup Comes with the booster, master cylinder, proportioning valve, and hard lines as an assembled unit. By the way, all hard lines are pre-bent stainless steel, definitely a bolt-in situation. There are two lines that do not come in the kit, but are optional order items. One goes from the proportioning valve to the rear drum brakes; luckily for '67 owners, that line is already there, thanks to the stock dual master cylinder, and driver-side routing. The other is the engine compartment line, also stainless, that routes between the two inner fender fittings. 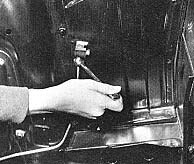 For '64-'66's, the rear brake line is eliminated and the T-fitting (on Passenger side inner fender) is plugged at its rear line junction. At the spindle end, all that's needed to convert from drum to disc is a few hand tools and a grinder to remove a couple of bosses on the GM single-piston calipers. After removing the stock brakes, and wiping off old grease and road grime from the spindle, make sure each spindle is in excellent condition. In other words, look for any bearing wear that may have cut into the spindle. If so, a good spindle must be used before attempting the conversion. This kit utilizes a custom aluminum hub and rotor combination, held together with high-strength cap screw bolts (Loc-Tite recommended), and features Timken roller bearings. Also, a custom steel caliper/spindle bracket bolts to the OEM spindle, and uses a spacer between the steering arm and spindle. With the bearings greased, and dust seal in, the new rotor can easily be slid into place, then the spindle nut tightened correctly, and a cotter pin installed. Before the calipers can go on, however, two bosses must be ground down for the required clearance. Once this is done, calipers can be mounted, and so can brake hoses (with banjo fittings) and the short hard lines to inner fender fittings. That's about it bolt on the wheels (in this case, the 14x6 Americans cleared just enough), bleed the brakes, and be happier knowing your Nova will stop much, much better! With car on jack stands, and with the wheels off, it's a simple matter of removing the stock drum Brake components, including the backing plate, shown. To take off the backing plate, top bolt (into spindle), and two lower bolts/nuts (securing steering arm) must first be removed. Once the spindle is exposed, and cleaned of all grease, it's the perfect time to check for any excessive wear in the wheel bearing. 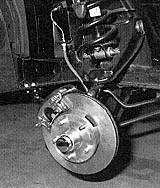 If so, the spindle must be replaced before this disc brake conversion can continue. 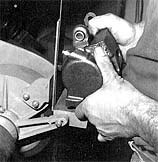 Note simple Bolt-on of caliper bracket to the spindle's two existing mounting points. Also notice short spacer (arrow) used between spindle 's front boss and steering arm. After the specially tapered socket-style Allen bolt (at top), and two new lower 7/16-inch bolts and nuts have been started, they can all be tightened. 3/8-inch Allen wrench, and recommended Loc-Tite adhesive sealant, is used for top bolt only; no sealant is necessary for two lower bolts, as Nylock nuts are supplied. Rotors and hubs come unassembled, but it's an easy bolt-together situation here as the pieces are mated via a handful of 3/16-inch Allen bolts (10, to be exact). Again, Loc-Tite is a great idea, just to make sure. Assembled rotor/hub can now be fitted adequately greased Timken bearings/dust seal, then unit can be slipped onto spindle, followed by tightening of spindle nut over washer and outer wheel bearing. Since this was a prototype, we took measurements with the stock drum brakes, and then with the new discs, to see how much each wheel surface would move outward. Make that inward in this case, a substantial 1/8-inch. Before each caliper can be mounted, a center boss must be ground flush in order to clear the new caliper mounting bracket. There's also another small part of the caliper which must be ground away. This time, it's located at the brake hose area (arrow). This is done so the new banjo-fitted brake hose can be properly angled, and not interfere with the spindle. It's Loc-Tite time again, for the caliper bolts that secure the caliper assembly to the custom caliper mounting bracket. A 3/8-inch Allen wrench is called on here. Jim Ries did his homework to come up with a booster/master/proportioning valve setup that would clear the Nova's shock fewer inner fender. As you can see, the plumbed assembly fits like a glove. The 7-inch Booster is coupled to a new 1-inch bore master cylinder, and a custom bracket supports a Delco proportioning valve, with all stainless lines. 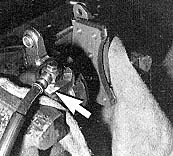 On '64-'67 models, the stock rear brake line is routed from passenger-side fitting, just Behind shock tower's inner fender. For this application, Ries eliminated the stock line by capping on the fitting, and ran a new (optional) stainless steel cross-over line, between fire two inner fender fittings. As you can see, it's a close fit between master cylinder assembly and inner fender, but it does clear. Also, fire hard line (shown being tightened with 3/8-inch wrench), that goes to driver-side inner fender fitting, can still be removed. Here's the finished disc brake setup for the passenger-side wheel. In this instance, we got a bonus as we discovered that 14x6 American Racing Torq-Thrust "mag" wheels cleared the calipers. Now we can rely on stopping this '66 Nova much quicker and straighter than the previous factory drum setup. Talk about a sanitary installation of the Booster/master cylinder setup, it looks Better than a factory installation. Note neat wrap-around stainless steel hard line (optional) from proportioning valve to rear drum brakes. Complete disc brake kit part number is CPP-6467-DK.